I really like books. Especially IT related books. When I'm passing a bookstore I can't resist it's temptation. So I enter and I'm going straight to the IT book department. For the last couple of years I collected quite some books. Some books are real eye-openers. Others are just trash. Good old Oracle PL/SQL. The programming language where my IT career started. On first sight a simple language, but very powerful. The author Steven Feuerstein writes very enthusiastic and recognizable. After reading his books you start to write better software! This book was a real eye-opener! After reading this book I only developed Oracle software using PL/SQL packages. Feuerstein calls packages the 'poor man objects'. A clever remark that I only started to appreciate after many years when I switched to Java. GoF, also known as the Gang of Four, wrote history with this book. You cannot hide in the OO world for these patterns. The patterns are part of the dialog with your co-workers. A must have for your collection! Finally a book that is more than just describing a bunch of API's. Johnson explains very well the real concepts of J2EE. His diagrams of web servers and J2EE containers will never disappear from my mind. When your having doubts about using EJB's, read this book. Johnson is also the founding father of Spring. Craig Larman created a good book. After switching from Oracle to Java I needed some more knowledge about Object-Oriented Analysis and Design (OOAD). 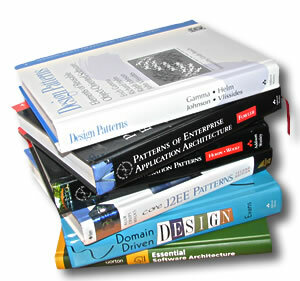 There are a lot of books around the subjects of UML and OOAD. This is one the few really good ones. Again an eye opener. When you start to think you understand Java and J2EE read this book about design. Martin Fowler says in an anecdote that Eric Evans was one of few people that really could teach him new stuff. Evans talks about Aggregates, Repositories, Factories and much more. Clear concepts that give you guidance when designing systems. At the link at InfoQ you will find a summary of his book. How much patterns can a man handle? Never enough :-) The world of integration and messaging was unknown for me. After reading this book all the new concepts and techniques fell into place. This presents a clear collection of design from which you can choose when designing a integration solution. With the current focus on SOA and ESB a very interesting title. On the site belonging to this book you can download some Visio templates that represent the pattern icons. An impressive collection of so called Enterprise Application Architecture patterns. Fowler proofs he is able to classify the different ways to design and develop enterprise applications. A clear overview that can act as a guidance when designing a system. This book was really read to pieces. Hibernate/JPA keeps surprising me with the many possibilities. This books helps you to choose between different design strategies. Another nice place to look for list of books is at the 'Listmania' section at Amazon.com.